Monster High - where screams come true! Twyla comes with a pet, diary, brush, doll stand, and character-specific accessories! Inspired by the Monster High: 13 Wishes TV special. 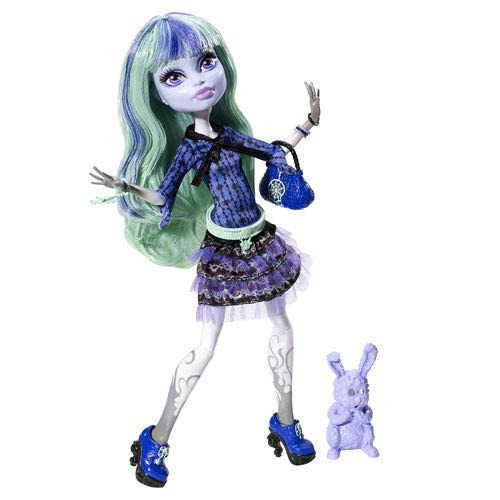 Make your screams come true with this Monster High Doll 13 Wishes Twyla Doll, inspired by the Monster High: 13 Wishes TV special! She stands approximately 11-inches tall and includes a pet, diary, brush, doll stand, and character-specific accessories. Ages 6 and up. When Howleen Wolf discovers a genie lantern, she turns Monster High upside down. Creature chaos ensues, particularly when Lagoona Blue is turned into a freshwater sea monster! But that's not all. Along the way, the ghouls make two new friends: Gigi Grant and Twyla.